Action Equipment Rentals Ltd. officially began back in 1977. Owner Gerry Tames started his family business with $1,000 and a goal: to operate a successful rental company that would support the needs of his fellow citizens. His perseverance paid off. 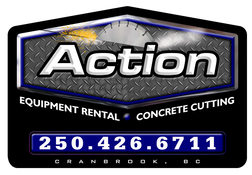 Action Rentals has grown to become a one-stop shop for homeowners and contractors throughout the Cranbrook region. Although the equipment has changed over the years, the mission remains the same. If you’re seeking quality tools and helpful advice, you’ve come to the right place! For your convenience, we will deliver and pick up your rental equipment to and from the job site. It is our mission to provide rental equipment that is in perfect working condition. We are committed to understanding our products, so you always get the right tool for the job and great customer service. We have gained a solid reputation by doing good work – this is why we’ve been in business so long. Word of mouth brings in the new and repeat business that has sustained our company through decades of growth. It’s that simple. How can we help? Visit us at the shop to find out if we have the equipment you’re looking for.